There has been plenty of talk about South Africa playing attacking cricket against India, but judging by what coach Russell Domingo said on Tuesday, fans should not expect the batsmen to be bounding down the pitch to the spinners or the bowlers to use the new ball like in a Test match. By KEN BORLAND. Although the limited-overs unit remains a frustration, a team full of great talent that for some reason just doesn’t click consistently enough, South Africa are unlikely to jettison a conservative approach in the three ODIs against India, starting at the Wanderers on Thursday. Captain AB de Villiers may have spoken about the need to strike early with the new ball in order to hold India’s powerful, all-action batting line-up in check, but Domingo said on Tuesday that this would not be a departure from what they usually try and achieve. “Taking wickets early is the only way to ever restrict a strong batting line-up, if you don’t get wickets you’re going to lose nine out of 10 games. They’ll feel the same way bowling against us. “But we try and be attacking every time we have the new ball so there won’t be drastic changes against India, you can’t carry three slips and a gully in an ODI. You’ve still got to be bowling consistent lines and throw in a few bouncers,” Domingo said. As far as the batting goes, one of the reasons South Africa has succeeded in just four of their last 12 run-chases has been their tendency to stagnate against spin in the middle overs. A typical Proteas innings starts with a flurry, before subsiding and wickets being lost as batsmen try and break the stranglehold with over-ambitious strokes, leaving the closing overs to be handled by the lower-order. But Domingo said this problem was specific to the matches (many of them) against Pakistan in the last year. “I don’t think we’ve had problems against spin bowlers in general, just one or two of them. A guy like Saeed Ajmal is world-class and the pitches in Cape Town and Port Elizabeth suited him. A lot of batsmen do battle against him and I don’t believe we have a weakness against spin. “Conditions are so important. In Johannesburg and Durban, it’s not going to turn as much and spin becomes less of a factor on the Highveld than on the coastal pitches. 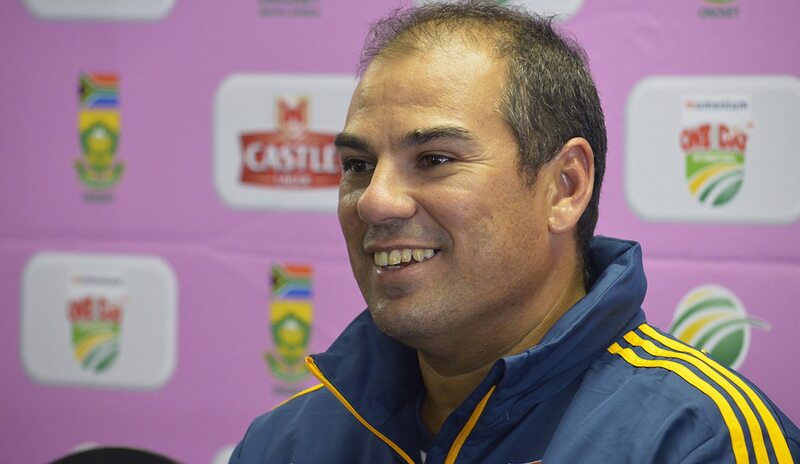 We’re looking forward to playing on the faster, bouncier wickets where spin is less of a factor,” Domingo said. The South Africans will be back at full-strength for the series against the world champions, with Jacques Kallis and Dale Steyn both returning to training and Graeme Smith back from compassionate leave after the death of his grandmother. The big selection question is who gets the axe to make room for Kallis – all-rounder Ryan McLaren or batsman David Miller. Domingo hinted that the Dolphins left-hander might be in the firing line, for the first game anyway. “It’s great to have Jacques back, he is a three-in-one player, but it does pose some selection problems. Other individuals have done very well, but when Jacques is available, fit and in-form, any coach would want him. “The challenge is that we then have to leave someone out. Ryan McLaren can feel hard done by that he was the player to miss out in Cape Town, but then against Pakistan’s batting line-up, in those conditions, it didn’t make sense to play five seamers. Maybe in Johannesburg, against India’s batting line-up, it will,” Domingo said.